With only 3 programming buttons and easy to read digital screen, this single line timer allows 2 customized watering cycles per day. 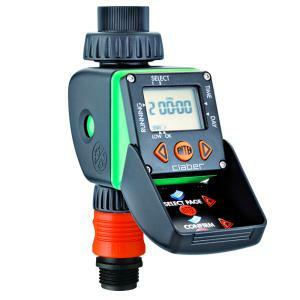 Designed to water daily or on specific days makes this timer ideal for water restrictions. Patented circuitry is completely sealed and watertight to prevent damage to electronic parts. Reliable solenoid valve design has no plastic gears that break or lock-up. Built-in stainless steel filter traps harmful contaminants that could clog or damage valves and is removable for cleaning. Valve is designed for smooth water shut-off that prevents hammer impact on piping. Timer operates on one 9v battery (not included) with a battery indicator to alert you when battery is low. Programs are retained for 15 minutes when battery is removed.